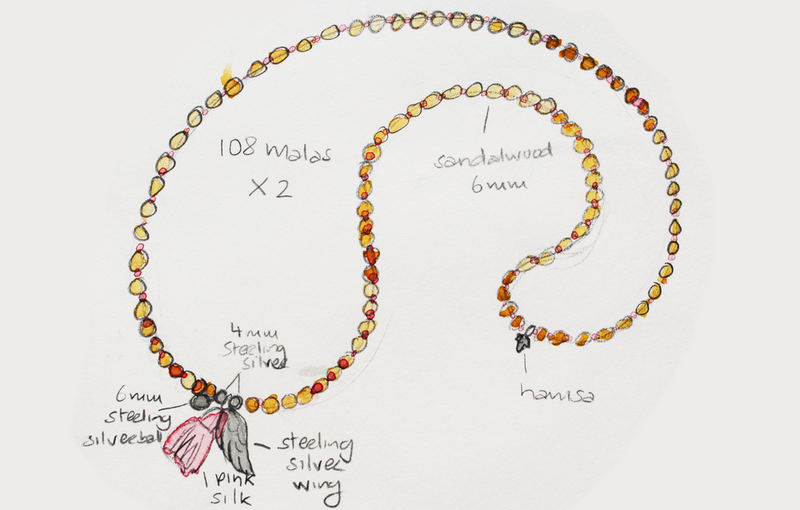 I’ve currently started designing my new range of 108 mala beads. The beads are made from authentic semi precious stones, sourced from China. They will be strung with silk thread, with a matching silk tassel, and sterling silver feature beads. The malas can be worn as a long necklace, or wrapped around your wrist. You don’t have to be a seasoned meditator to get the benefits of malas. Set an intention for the day, and wear your malas as a reminder. Between the protection of your little hamsa hand, and the earthy materials of the malas, they will keep you safe and grounded throughout the day! Tibetan Buddhist mala beads are used to help settle the mind by counting chant mantras in mindfulness meditation practices. They generally have 108 beads, which is long considered to be a sacred number in the yoga tradition. There are lots of different interpretations as to why it is precisely 108 beads. 108 is a harshad (sanskrit for ‘joy giving’) number. A harshad number gives you an even number when the sum of it digits (1+0+8=9) is divided into the number (108/9=12). There is a total of 108 letters in the sanskrit alphabet (54 male and 54 female). There are 108 energy lines found in the body that converge to form the heart chakra. The number of sacred sites in India is 108. It’s also said that the distance of the sun and the moon to earth is 108 times their diameter!